Now that I am back here in my native land and now that I finally got an inspiration to write a gold piece, well, I just feel better about the whole darn thing! The inspiration for today's piece I got from two new buyers of precious metals, one at Zero Hedge and one at pmbug.com. I responded to both of them and mentioned something I had learned from FOFOA, being overly general for the moment, that gold is perhaps the very best, the Number One product which has the slowest decline in the economic notion of marginal utility. Marginal utility roughly translates into how much more you would like to have the next unit of whatever product you are interested in. Here is some of what wikipedia has to say about "marginal utility" (http://en.wikipedia.org/wiki/Marginal_utility). All text immediately below in dark green below is from wikipedia. In economics, the marginal utility of a good or service is the gain (or loss) from an increase (or decrease) in the consumption of that good or service. Economists sometimes speak of alaw of diminishing marginal utility, meaning that the first unit of consumption of a good or service yields more utility than the second and subsequent units. My memories of college economics classes match the above, I do not really think that wikipedia has to have that citation at the end there, although someone who knows economics very well could score a quick brownie point by giving them the citation they feel they need (junior professors and grad students take note!). Different concepts of utility underlie different theories in which marginal utility plays a role. It has been common among economists to describe utility as if it were quantifiable, that is, as if different levels of utility could be compared along a numerical scale. This has significantly affected the development and reception of theories of marginal utility. Concepts of utility that entail quantification allow familiar arithmetic operations, and further assumptions of continuity and differentiability greatly increase tractability. Contemporary mainstream economic theory frequently defers metaphysical questions, and merely notes or assumes that preference structures conforming to certain rules can be usefully proxied by associating goods, services, or uses thereof with quantities, and defines “utility” as such a quantification. Another conception is Benthamite philosophy, which equated usefulness with the production of pleasure and avoidance of pain, assumed subject to arithmetic operation. British economists, under the influence of this philosophy (especially by way of John Stuart Mill), viewed utility as “the feelings of pleasure and pain” and further as a “quantity of feeling” (emphasis added). Though generally pursued outside of the mainstream methods, there are conceptions of utility that do not rely on quantification. For example, the Austrian school generally attributes value to the satisfaction of needs, and sometimes rejects even the possibility of quantification. It has been argued that the Austrian framework makes it possible to consider rational preferences that would otherwise be excluded. In any standard framework, the same object may have different marginal utilities for different people, reflecting different preferences or individual circumstances. Let's do one of my beloved "Thought Experiments" here to explore this graph. "Let's say" you are the head of a happy household with FIVE CHILDREN (are you reading this Amy? ), and let's also say that you just won a decent amount of money from your local lottery (say $1,000,000 free and clear, in cash now, taxes already paid). Let's also assume that you are middle class, not deep in debt and have your retirement money put aside OK. So, you are free to spend the money! You determine that your major purchases are to be to upgrade your transportation, you deserve it, so why not? So, before you head out the door, you are at the very beginning of the above graph. You decide to buy a BMW! Wow, that felt good, didn't it? You are now at that next point on the graph, shared by the blue square and the red dot. The Y-axis is your "utility", how good you feel being a BMW owner. You got a nice chunk of utility from buying the car. So, you decide to buy your wife as well! Smart move, she is likely to be very happy too. Now, take a close look at the graph to see WHAT it is charting. The red dots are your TOTAL happiness (utility) from buying the two (for now) cars. The blue squares show your marginal utility, that is how much EXTRA pleasure you got from your most recent purchase. You will note you got almost as much pleasure from buying that second car as from the first. That is still pretty good though. You then decide that your oldest child gets to have a BMW as well, s/he's a good kid, right? So you buy BMW number three. But, to be fair, you decide to buy EACH one of your children in turn a new BMW. At this point, you are probably not getting any extra happiness from that seventh car! And THAT is where the blue square is there at zero (no extra happiness) and the red dots are as high as they are going to go. Let's say you buy yet another BMW... You will likely NOT derive any utility here, in fact, if this Thought Experiment follows this graph, you would LOSE utility (be LESS happy) because where are you going to park that eighth car...? But, gold is different. I mentioned near the very top of this article that I responded to two new buyers of precious metals. I told them both that AT LEAST FOUR TIMES that I had reached a convenient "round number" of ounces of gold that I wanted to hold, and that would be that. I would not need anymore. But, soon thereafter, I found that, well yes, that I could buy just a little bit more gold. So, gold would NOT follow the above graph from wikipedia. My best guess is that gold would follow a path similar to the "y = ln(x)" curve. 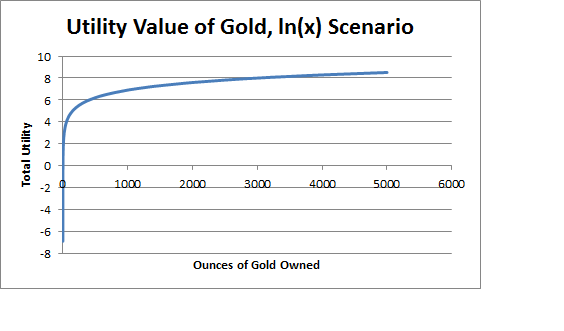 Where the Y-axis is total utility and the X-axis increasing gold ownership through time. The ln(x) curve is the INVERSE of the exponential curve (the e^x, "e to the x power"). 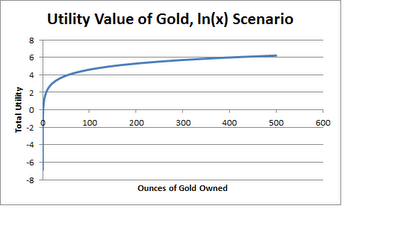 There are two graphs below, the first one is ln(x) up to 500 oz of gold owned and showing a "utility" of about 6.1. The second graph shows ln(x) out to 5000 ounces, with a utility of about 8.2. Three quick notes about the above two graphs. The first is that I put in "Y-axis" values below zero because that is the actual way the ln(x) curve is. Secondly, note each unit of "utility" is worth a LOT (5000 oz of gold is approximately 206 lbs of gold, troy ounces remember)! Third, take a good look at the SHAPE of the two curves, they are essentially identical! They scale exactly the same, just like the more well known exponential curve. If I am interpreting this right, marginal utility of increased gold holdings scales very nicely all the way up the curve! FOFOA is a deep thinker on gold, his work is hard to completely understand (for me anyway), yet he has a fanatical following (myself included, although I do not fully understand all of his points, that requires a lot of reading and thinking). I welcome criticism of my interpretations of FOFOA's words below, as he DOES have followers who do understand 100% of what he is trying to show to the world. Below is FOFOA from his article above, here he discusses the word "value". FOFOA's words have the colored background. But value is a vital concept to understand. So here we will explore some misconceptions associated with this most dear and valuable word. Probably the most common misconception is that price and value are the same thing. They are not. They are related but different. Price can be precisely known, but true value can only be estimated or guessed. And because price changes, price is always wrong while true value is always right, even though it is unknown. So price and value are always different. Value is always either higher or lower than price. There is a little trick to knowing whether value is higher or lower than price. This trick will reveal the direction of value, but not the magnitude of the disparity. The trick is to look at which direction the government wants to influence any price. If the government is attempting to manage a price upward, then it is a safe bet that the value is lower than the price. And if the government would like to keep a price down, then you can be pretty sure the value is higher than the price. It is certainly fair play to place your bets on the ability of government to overpower the gravitational pull of value. But when you do, you should be aware that you have just purchased the opposite of real value. And to understand why this may be detrimental to our financial wellbeing, we must first understand the concept of value. The Labor Theory of Value (LTV) was the mainstream and widely accepted value theory prior to the 1870's, culminating in the controversial economic theories of Karl Marx (1818–1883). Then, in 1867, a young journalist named Carl Menger (1840–1921) noticed a discrepancy between what the classical economics he had been taught in school said about price determination, and what real world market participants were paying for goods. In 1871 Menger published "Principles of Economics" (Grundsätze der Volkswirtschaftslehre), thus becoming the father of the Austrian School of economic thought. It was in this work that Menger challenged the classical cost-based theories of value with his own marginal utility theory of value. From what I can tell, the basic difference between the approach of Marx versus Menger is that of activist versus observer. The Marxian Labor Theory of Value tells you what something's value should be, while marginal utility observes what it actually is, and then attempts to explain the observation. The above comments by FOFOA do a nice job of putting much of Marxist (and Socialist) thought onto the trash heap of history... What "should be" as opposed to what something "is." There is more to this story, but before we proceed, let's take a quick look at the marginal utility of gold as a store of value. Take the man above with $1.5 million in disposable cash. Say he buys himself one $50,000 BMW and one $55,000 gold eagle coin. He has just obtained the full utility of a fine automobile as well as the value preservation of that same purchasing power, for up to thousands of years if he should so choose. Now say he buys one more $55,000 gold eagle coin, and then another, and another, and so on until all his cash is gone. In the end he will have 26 gold coins. And here's the question: Will that 26th gold coin purchase provide the same utility or diminished (less) utility than the first? Remember, the only utility of gold coins is that they retain their value for thousands of years. That's all they do. And hoarding them doesn't interfere with any other economic activity, at least not when they are not "official money." The answer is "the same utility," because unlike ANYTHING else, (yes, even silver), gold has INFINITE marginal utility in this particular role. 1) What a Giant was (how much gold does one have to have to be one)? 2) Would the marginal utility work the same for a Giant as for us "Shrimps"? I’ve just got a second, but the marginal utility of gold is unlimited. Your 10,000th tonne will provide the same use as your first ounce. Just look at the Eurosystem. That said, for true Giants, the calculation is a little different than it is for us shrimps. Also, you’ve got to separate out the transition period (now) from Freegold (after revaluation). Right now, your gold is promising to outrun all other hard assets by a 40:1 margin. 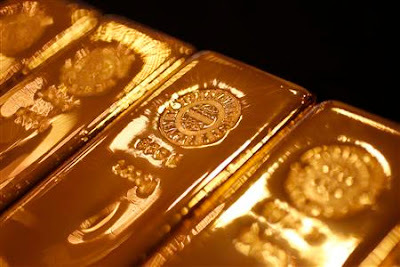 After Freegold, it will preserve value almost precisely as well as other hard assets, but it will simply be more liquid and portable than, say, art or antiques. To me a true Giant is a multi-billionaire, so maybe 20+ tonnes of gold? But let’s look at the “Giant calculation” both now and in Freegold and you’ll see they won’t go “all in” under either. 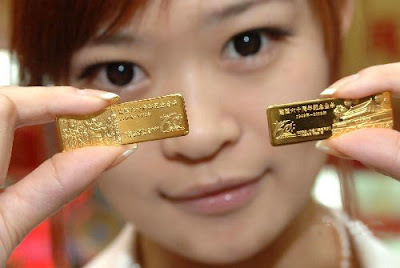 Right now gold is so underpriced that a true Giant could break the system and draw unwanted attention on himself. So right now, the smartest thing for a true Giant to do is preserve the wealth he already has and maybe make a small percentage gain through the transition. Read the beginning of this post for more on that. After Freegold, the true Giant will only keep that portion of his wealth in gold that he wants to keep either liquid or discreet. The rest will be equally preserved in mansions, art, classic cars, jewels and antique furniture which he can enjoy and show off. So you see, the calculation is different in both cases, but that doesn’t mean the marginal utility is lower. Some people would argue that something else has infinitely positive marginal utility! This is exactly what I'm experiencing RIGHT NOW! It really make me think not to become a pm addict. I think next month will be the first month since 4 years that I'm not going to buy extra anymore. First I thought it was because the reason why the fun factor wasn't there anymore that it was because of the routine but like you wrote, in my head I'm constantly saying to myself for these last 6 months : "I've got more than enough". For me (a very simple shrimp), the issue is much simpler. I don't derive pleasure from purchasing metal. It's a non-emotional event. I'm simply storing excess wealth - whatever wealth I can manage to consider excess - for the very long term. The more excess wealth I can muster, the more PMs I buy. The wealth mustering comes first and that's where the fun is. YMMV. I have an entirely different take on buying PM's. I wish I did not have to own ONE ounce. I look at it as I have no choice.It is nothing but insurance. How much is enough?,that question for me is answered in the amount of my total net worth. ALL I desire to do is to make sure if the PTB ever lose control, and devalue my fiat holdings, the PM's I own will go up in value a like amount and at least equal what my total fiat/net worth was. Some here have many years left tp produce, some have less now than they used to. Knowing that, I know I cannot start over, and get back to where I am now. To me, there is no other reason to own Gold. In the end, at least to have a shot at coming out whole,where I started from.The sheeple will not, and I refuse to be a sheeple. My family cannot afford to allow me to be that ignorant. One of your best! Thanks for the condensed FOFOA version as it applies to your thesis. One more piece of the puzzle for my own gold acquisition plans. Wow, guys, thanks for your great comments! I appreciate them all! "That's IT! Nada Mas! No more gold!" Thank you for putting it together and sharing. I am fully innvested in shiny and have no dry powder, just enough for a year of living expenses at current costs. I used to get excited / depressed with big up / down days but have mentally detached myself from the metal stored in Goldmoney and Bullionvault in Zurich. It could all be rehypothecated and I will simply shrug and live another day. I have placed my bets and now eat popcorn and await the outcome. I never felt any utility from any of my metal purchases, just relief to be out of paper, out of serious bricks n mortar ( but not the fun, bugout sites) and no significant pension or investment in stocks n shares.